CEOs of Six Flags, Basic Energy, and Spirit Realty top the list. 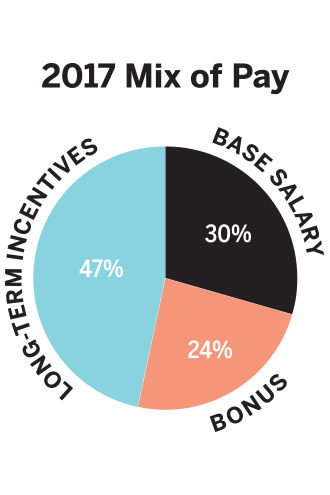 Plus, breakdowns by industry and mix of pay in this year's study of middle-market CEO compensation. Net income climbed a median 24 percent at Dallas-Fort Worth middle market companies—and the chief executives running them were handsomely rewarded. Those are among the findings of D CEO’s annual executive compensation report, which looks at companies with annual revenue of $150 million to $1.5 billion. Combined, the 50 DFW-based companies on this year’s list generated a total of more than $31 billion in revenue. For the ninth straight year, research was conducted by Paradox Compensation Advisors, a Dallas-based consulting firm. The analysis looked at total compensation (base salary, annual bonuses, and long-term incentives, such as stock options and stock awards), along with revenue and net income. The information is based on the most recent full fiscal year, which for four of the companies is 2018. To be included, the company’s CEO had to be in place for the full fiscal year (or sufficient information was provided to project full-year pay). The net income growth of 24 percent is significantly higher than the median 9 percent net income increase in the prior fiscal year. What’s more, income growth in the most recent fiscal year was produced on a 9 percent median increase in revenue, indicating much higher profitability than in the prior fiscal year, when net income growth exactly tracked revenue growth. “The economics of these companies is the strongest we have observed in the nine years since the study began,” says Marsha Cameron, managing partner and co-founder of Paradox. As one might expect, CEO pay rose substantially. The median increase in total direct compensation was 9 percent, the largest in the nine-year history of the study. Oil and Gas continues to be the highest-paying industry for CEOs among DFW middle market companies. No one had a better year, percentage-wise, than Holly Energy Partner’s George Damiris, who received a 338 percent increase in total compensation from 2016 to 2017, going from $452,187 to nearly $2 million. Two industries—Technology and Financial Services/Real Estate —increased median CEO pay by double digits (30 percent and 45 percent, respectively). The median compensation change in Technology was driven by CEOs at all but one company seeing a bump in pay. The increase to Financial Services and Real Estate total compensation improved the industry’s ranking from fifth-highest-paying in the prior fiscal year to third-highest in the most recent fiscal year. The median increase in long-term incentives during the last fiscal year was 6 percent. In the years since D CEO began the study, more middle market companies award long-term incentives regularly to the CEO, and the percent of total pay associated with these vehicles (stock options, stock awards, etc.) has grown to an average of 47 percent. As data below reveal, total compensation for the last fiscal year, top to bottom, ranges from $14.9 million for Six Flags Entertainment CEO James Reid-Anderson to $405,000 for Alfredo (Al) Bala at Mannatech.